UPDATE: When I wrote about the value of Flipboard’s user-created magazines a couple of days ago, one of my major complaints was that folks could see them only if they own an iPad, smartphone or Android tablet. Well, the FB folks have fixed that. As of today, I (or any other FB user) can mail you a link to my magazines or post a link on social media, and when you click, the magazine opens in your Web browser. This vastly expands the utility of the magazines, since you can now let anyone see them. 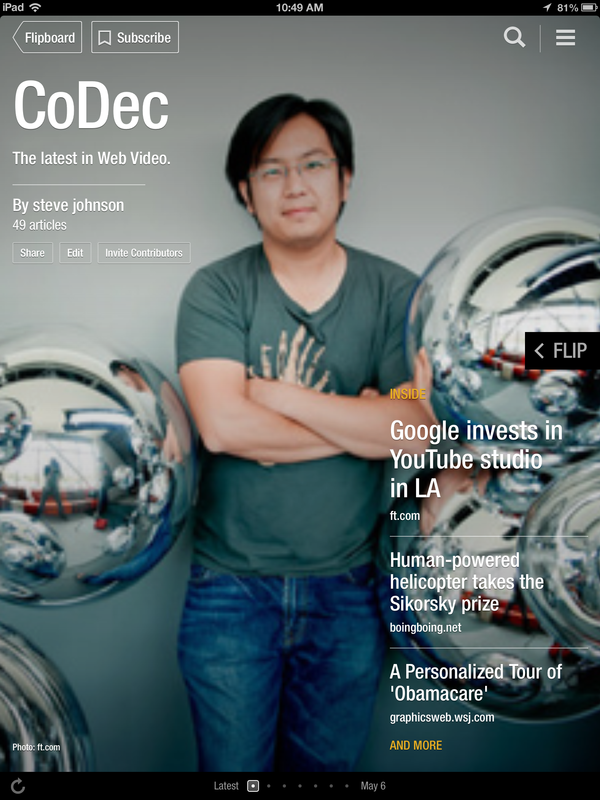 Here are links to three of my magazines, on Web Video, Photos, and Data Visualization. My purpose in creating these is to collect stuff on a given topic that I can then use in class, and now I can use FB’s web page to organize each magazine and then mail links to it to students at the beginning of class. HINT – Once you open one of my magazines, click on the small icon at left with three short parallel lines. That will take to FB’s choice of best user-created magazines. I’ve been using Flipboard’s new “Create Your Own Magazine” feature for about three months now, so it’s time to report on how it’s working. I’m basically very happy with the software, that allows you to store your Web page bookmarks as “magazines” on Flipboard, displayed in the software’s unique layout. For now, Flipboard is only available for iPads and iPhones, Android, and Windows 8 phones. The basic application allows you to select feeds from Twitter, Facebook or various magazines and pull them into Flipboard. 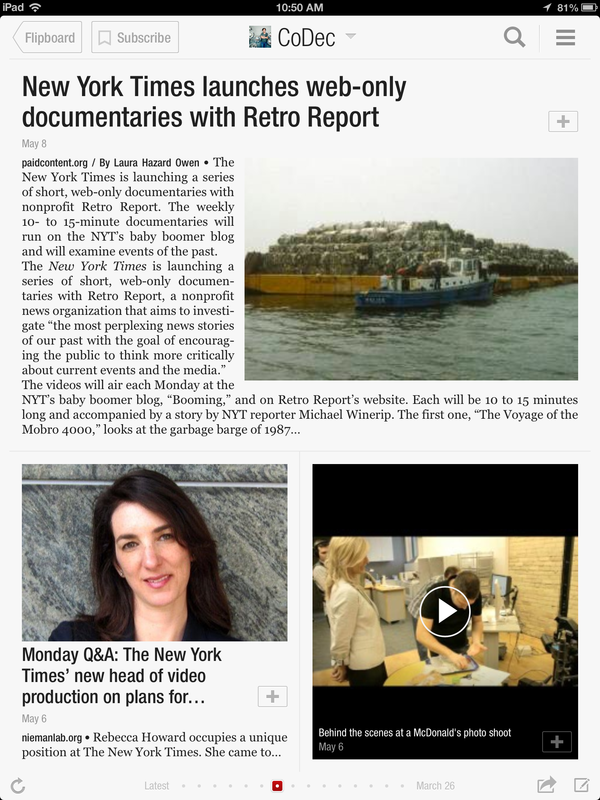 The app then displays the headline, photo or illustration, and the first 1-3 grafs of the content, laid out magazine-style, with 2-6 items on a page. You turn the pages by sliding your finger from right to left, “flipping” them. It’s a far better way to browse a Twitter feed featuring links or photo, e.g., because you don’t just see the url — you see the actual photo or article headline, along with the first few paragraphs of the text. Content from several dozen Web sites, including The Economist, Salon, National Geographic and The Guardian, are also available, in the same format. But about three months ago, Flipboard announced a new feature that allows readers to create their own magazines. First, you set up your magazines, by title and category. For example, I created magazines for Photos, Data Journalism, Web Video, Teaching, Journalism, Mobile apps, Gadgets and Music. Now, as I browse content on Flipboard, a small plus sign is visible to the side of every article, and if I want to save it in one of my magazines, I just click. Far more powerful, however, is a Pinterest-like feature that allows me to add a link to my Firefox or Safari browser. With that installed, whenever I am browsing anywhere on the Web, I can click on the “Flip” link and a window pops up, allowing me to add the link to one or several of my magazines. 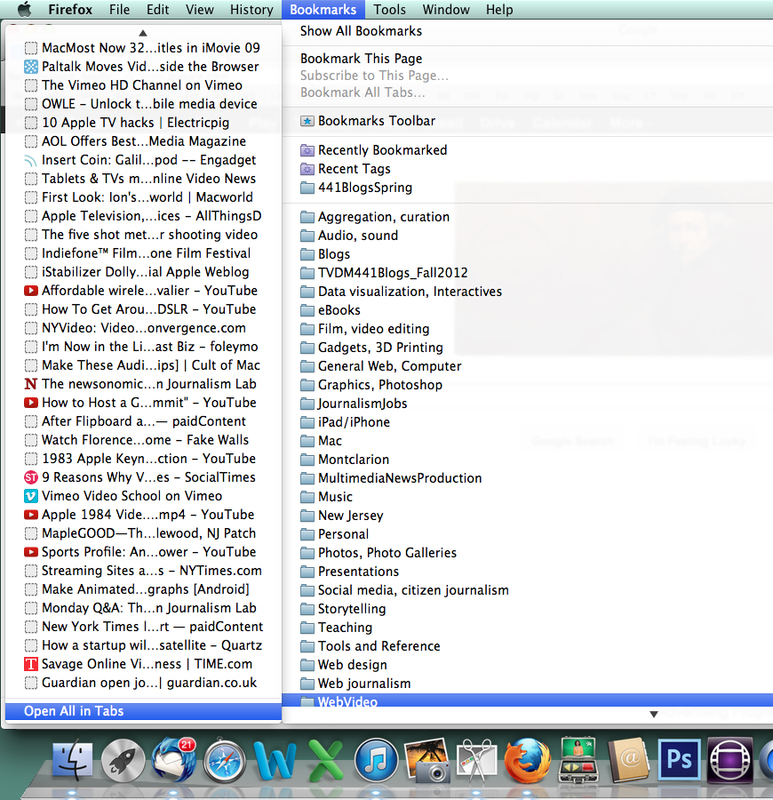 You may be asking how this is any different than just storing the URLS for those Web pages in my bookmarks folder. At a basic level, there is no difference. 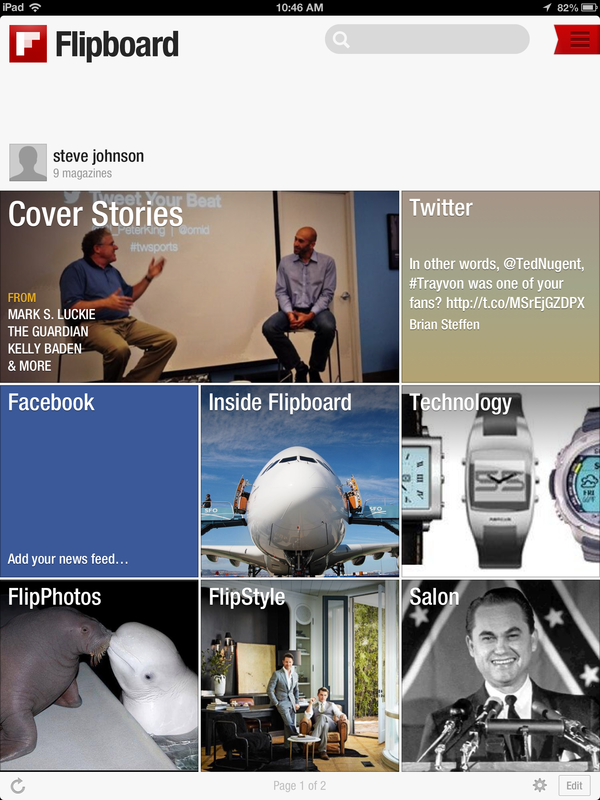 I generally add both a bookmark and “flip” the link to my Flipboard magazine whenever I find something of interest. But Flipboard’s magazine-style layout makes it much easier to find a URL long after you’ve forgotten why you saved it. By displaying the headline, photo or video or illustration and the first few grafs of a story, you can quickly remember what the article is about. Your magazines by default are public, so they can be followed by anyone else interested in your topic. At some point, for example, I could send a note to my fellow online journalism professors across the land, letting them know that I have collected several hundred links to great examples of web video, available for their classroom use. Flipboard has already made one upgrade to the service. About six weeks ago, they announced a Web page where you can log in and edit your magazines. You can drag and drop each item into whatever order you like, and you can also create a permanent title page for your magazine (by default, Flipboard uses the art from your most recent post as the cover page art). 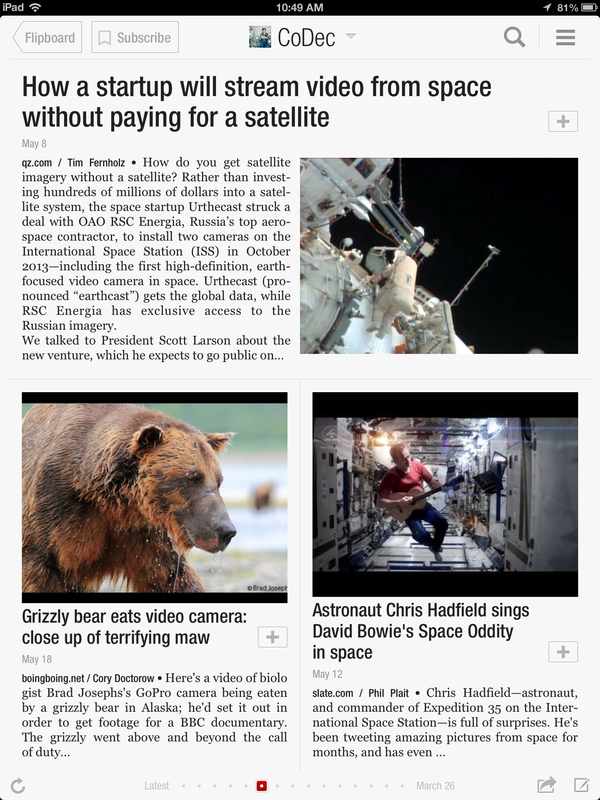 There are still some missing pieces for Flipboard to be more useful. I’d like to be able to write new headlines for the articles, e.g., and I’d like the ability to create subsections. For example, in my Photos magazine, I’d like to have one section for great examples of photos, another for photo gear, and a third for how to take photos. And most importantly, I’d like to be able to share the content on the Web and not just on a tablet or smartphone. Most of my students have laptop computers, but almost none of them own a tablet computer.